For those who want an excellent all-in-one security solution, the cost may be worth it. Norton is one of the oldest names in PC security—and despite some ups and downs, it’s still one of the best. Currently, Symantec offers several versions of its long-lived antivirus software: The current flagship product is Norton Security Premium, which costs $110 per year. Following that are Norton Deluxe ($90/year), Norton Security Standard ($70/year), and Norton Antivirus Basic ($50/year). This review covers the top dog among the set, Norton Security Premium. Downloading and installing it is simple enough, and the program doesn’t try to add a lot to your system outside of the program itself. It does, however, encourage you to enable its own browser-based password manager once you’re up and running. 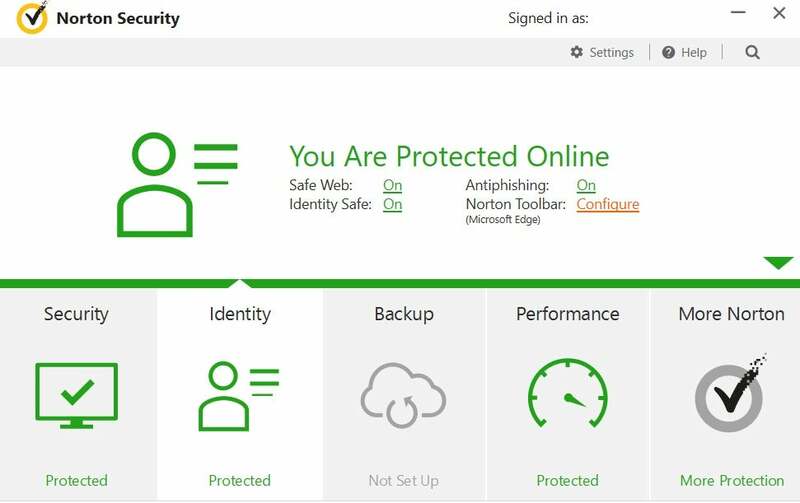 Norton Premium’s dashboard is divided into four main categories: Security, Identity, Backup, and Performance. There’s also a fifth section that houses account management, access to extra features, and advertisements for more Norton services and apps. Like many antivirus programs, Norton Security uses a color-coded scheme where green means you’re protected, yellow means caution, and red means you’re not protected. Norton Security’s interface is clean and organized. The Identity section, meanwhile is about protecting you. You’ll find the anti-phishing settings here, as well as Norton’s “Identity Safe,” which is the desktop version of the built-in password manager. Like other services, the safe can house your username, passwords, addresses, credit card information, and secure notes. Norton does have a nice tags feature to help you better organize your data, which you won’t always find in all password managers. Backup is where Norton lets you setup and manage the 25GB of free cloud storage that comes with the suite. You can use it to upload files or folders to Norton’s servers via encrypted incremental backups. 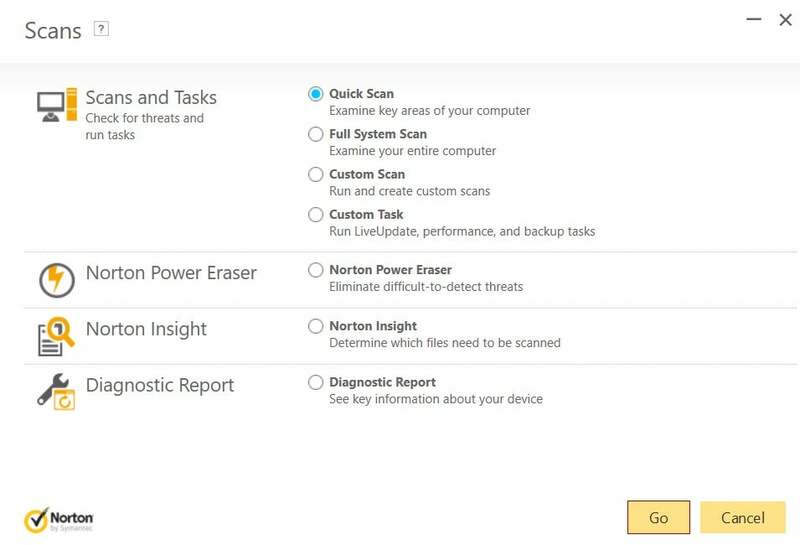 When you activate the feature, Norton monitors your documents, pictures, contacts, and other items by default. It will not, however, backup your videos by default or any email databases you may have. Performance, meanwhile, is the least useful of the categories, since its features are mostly redundant. You’ll find options like a file cleanup utility, disk defragmenter, and a tool for restricting startup programs—all tools that come built into Windows. If you want to stop programs from starting up at boot, for example, the Task Manager in Windows 8.1 will work just fine. The Backup section does have a graph that details the current processor usage of Norton and Windows, as well as recent security events and alerts from Norton. Norton Premium 22.9 received high marks from both A-V Test and A-V Comparatives for malware detection. In June, A-V Test threw 10,252 samples of malware at Norton and the software came back with a 99.9 percent detection rate. A-V Test also put Norton up against 202 samples of zero-day, web, and email threats for which Norton came back with a 100 percent rating. A-V Comparatives got a similar result of 99.8 percent in March using nearly 38,000 samples. However, that was with an active Internet connection: Offline, that detection rate fell to 86.8 percent. SE Labs, meanwhile, gave Norton a AAA rating. Norton did not have an appreciable drain on resources. When we ran PCMark 8’s Work Conventional benchmark, which simulates basic tasks like spreadsheet editing, web browsing, and video chat, our test PC scored 2538 without Norton installed. 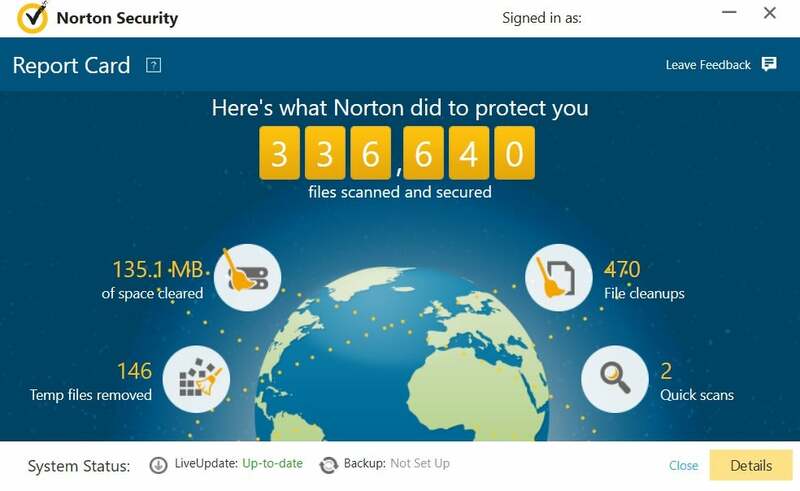 When we installed Norton Security Premium, started a full scan, and then ran PCMark 8 again, the second score was 2526. That’s a drop of less than one percent and within the PCMark 8 benchmark’s typical margin of error. We also didn’t see any real difference in performance during our Handbrake test, which puts far more stress on a system. It took our test PC one hour, fifteen minutes, and 30 seconds to transcode a 3.8GB MKV file. With Norton installed, the time was twenty-two seconds faster at 1:15:08. Norton’s built-in report card feature. Norton is extremely user friendly and well organized, and it doesn’t interfere too much with users’ day-to-day activities. That last part is key since security programs work best when they stay out of your way. The software also has some handy extras, like the online backup and password manager that make it an all-in-one security suite. You certainly have to pay for the privilege, however. Symantec will give you a really nice discount for your first year—45 percent off—but don’t be fooled, as you’ll ultimately be paying $110 for the privilege of running Norton Security Premium. Still, if you feel you’ll get your money’s worth, Norton is an excellent choice for a security suite.